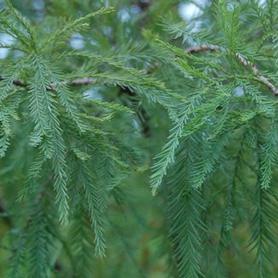 'Nutans' Pondcypress has short, horizontal branching with pendulous, delicate fern-like foliage. Taxodium ascendens 'Nutans' has an upright and narrow habit, very unusual and showy in the landscape. 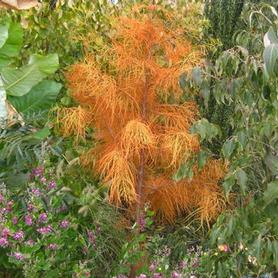 A deciduous conifer with beautiful orange buff fall color. It is wet site tolerant. PRN Preferred: The most beautiful fern-like foliage of all the Pondcypresses we grow. 'Emerald Shadow' was found by the great nurseryman Don Shadow in a block of seedlings on his nursery while hunting rabbits with his grandson Elijah. He was struck by its extremely uniform upright habit, as well as its beautiful deep green foliage color. The deciduous ferny foliage turns a lovely amber yellow in the fall before dropping, leaving behind a beautifully uniform silhouette in winter. 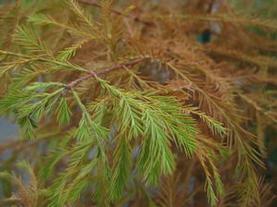 Taxodium 'Emerald Shadow' is both salt and wet site tolerant. Lindsey's Skyward™ Bald Cypress is a very columnar deciduous conifer that is considered a dwarf Taxodium. The fern-like needles emerge in lovely shades of soft green, displayed on very upward facing branches. As the summer progresses the foliage deepens to dark green, followed by amber and copper colors for an extended period in autumn. Winter interest is provided by the dramatic symmetrical columnar habit, after the needles have fallen to make a showy bronze carpet. 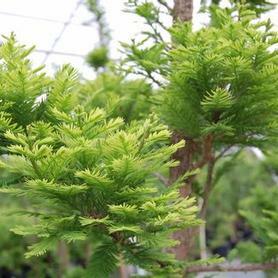 Taxodium distichum Lindsey's Skyward™ is an excellent choice for compact sites as well as wet sites. It has a non-aggressive root system with no surface roots or knees. Found as a chance seedling by the Oklahoma nurseryman Robert Michael Lindsey. 'Peve Minaret' Baldcypress is a tight, compact form of our native Baldcypress with interesting dense, fern-like foliage which turns brownish orange in the fall. Taxodium distichum 'Peve Minaret' is a rare deciduous conifer, perfect for smaller gardens or tight spaces. It is also salt and wet site tolerant. 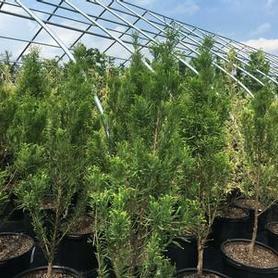 Shawnee Brave™ ('Mickelson') Baldcypress is a beautiful deciduous conifer, with soft green foliage in spring and summer. The leaves turn an attractive, reddish tan in fall before dropping. Form is very attractive in winter because of its extreme regularity and perfect straight trunk. Extremely tolerant of salt and wet sites, also makes an excellent narrow street tree. An Earl Cully introduction. 'Green Giant' Arborvitae is probably a cross between T. plicata and T. standishii, with an excellent habit and rate of growth. 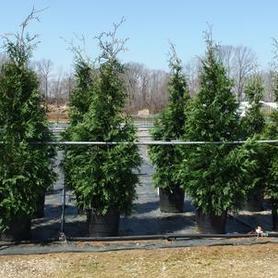 This Thuja makes a tight, uniform evergreen hedge in record time. Becomes a broad pyramid when it has the space. It is also salt tolerant.